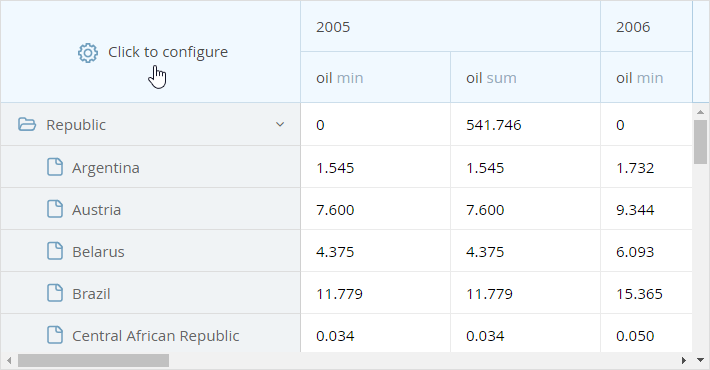 Pay attention to the Click to configure area of the datatable upper left corner. It is highlighted each time you hover the mouse pointer over it, while clicking this area will make a configuration window show up. Fields contain all data properties (such as name, year, continent, form, etc. from the sample dataset) EXCEPT for those in Rows, Columns or Filters. 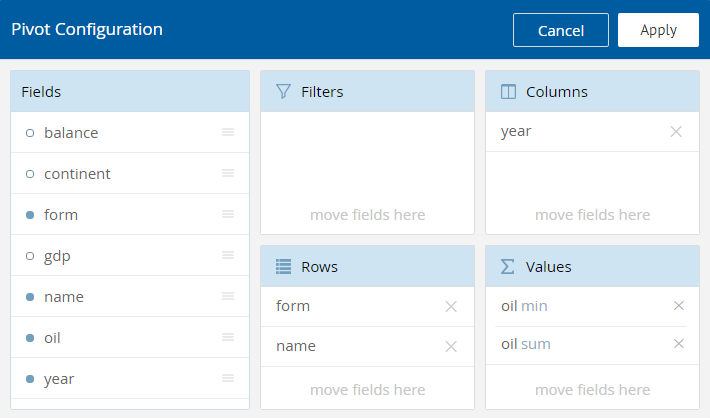 Fields dragged or initially set to Filters define data properties that will be used as filters for the datatable. 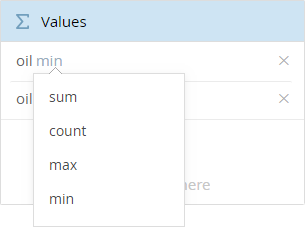 Current data operations come together with values they are assigned to in the Values section. Right there they can be changed with a couple of clicks. Count - counts the number of occurrences of this property and shows it. In addition to the above-mentioned prebuilt operation types, you can as well create a custom one. text - filtering is performed by symbols you type in the text field. It supports base math comparison operators, so you can type something like "< 100", "> 2.5" or "= 12". datepicker - filtering is performed by dates selected in the calendar. You can work with filters via the filters collection. Check the detailes in the article Working with Filters.